Welcome to the advocacy tools page of the State Policy Initiative! 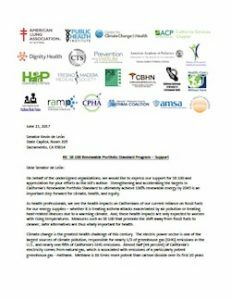 There are dozens of ways to take action on climate change policy–and therefore our health–by lending your voice as a health professional. You can use these tools towards several important goals: to inform policy makers that climate change is a critical health issue; to raise the health voice in state discussions about climate change policy decisions; strengthen support for climate action at the state level; and to ultimately integrate health and health equity into state climate policies. For more background on the initiative, click here. The tools below, created by a range of reputable organizations, will help you get started. We decided to use resources from other organizations so as not to reinvent the wheel, but because these resources were developed by other organizations and not for our exact purposes, they may contain some imperfections such as references to the organization that created them or discussing federal advocacy instead of state advocacy. Despite this, we think the overall tips and lessons from these resources can be gleaned and applied to your state policy initiative efforts. If you have any questions about any of the resources, please don’t hesitate to contact us. Climate, Health, and Equity 101: How does climate change impact health? What are the connections between climate change and health equity? What are the best resources to learn more? Policy 101: How are policies made? Where does the health voice come in? Who should I talk to? Communicating With Legislators: How do I get a meeting? What do I say to make sure my message gets across? What is my message? Op-Eds: Templates, examples, and tips for writing and placing effective op-eds, specifically for professionals like you. State Climate Policy Tools: How do I find policies to act on? We’re eager for your feedback! Tell us what works and what’s missing. As an advocate, you may want to become more informed on the connections between climate, health and equity or be able to provide resources to others who want to learn more. The resources below provide an excellent starting place to learn more about the connections between climate change, health, and equity. 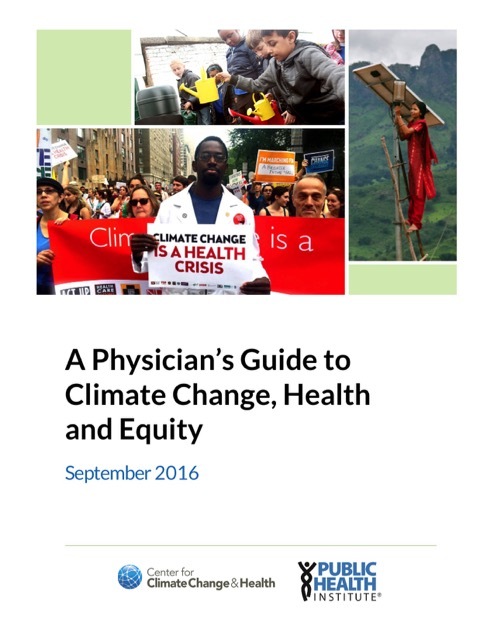 The Guide explores the complex and multifaceted connections between climate change and health, disproportionate burdens and the impacts on health equity, and opportunities for solutions. To learn more about the connections between climate change, health, and equity see Climate Change and Health Inequities: A Framework for Action, Climate Change and Health: Transcending Silos to Find Solutions, and The Built Environment, Climate Change, and Health: Opportunities for Co-Benefits. If you want to influence climate legislation in your state, it is helpful to understand the ins and outs of the legislative process. The following resources provide an overview of how state policies are generally made as well as how you can follow bills through the state legislative process. 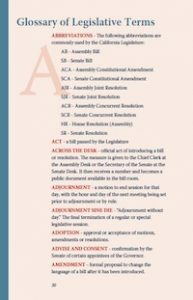 This one-pager from the American Academy of Pediatrics provides a brief overview of the state legislative process. The steps for how a bill becomes a law also generally have specific dates by which each step has to happen during the legislative session. The dates for these steps are usually outlined in a legislative calendar available through the state legislature’s website. Here’s an example of California’s 2017 Legislative Calendar. Bills can be complicated to read and they are generally amended as they make their way through the legislative process. This sample bill resource from the California State Senate identifies a bill’s key components. Legislative staff generally create a summary of each bill and update the summaries as the bill makes its way through the legislative process. 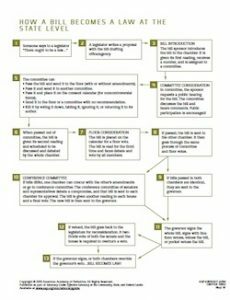 This sample bill summary resource from the California State Senate highlights the key bill summary components. Many states have legislative websites that allow you to search and track bills by bill number, topic, or committee. Here’s an example of Oregon’s legislative site. As you begin to track policy more closely in your state, you may come across unfamiliar terms. Here’s a glossary of key legislative terms compiled by the National Conference of State Legislatures that can serve as a reference. There are many ways to advocate on policy. Lobbying your legislator is just one of the ways. If you plan to lobby in your official capacity you should check with your organization as there may be restrictions and/or reporting requirements. 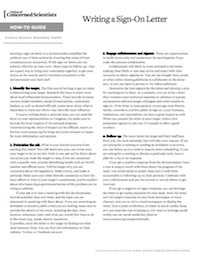 Learn more about what constitutes advocacy vs. lobbying from this NACCHO resource. There are many ways to share your health message with legislators. Some of these include writing a letter, having an in-person meeting, or testifying in front of a committee. The resources below provide you with tips and tools for communicating with your legislators. Before contacting your legislators it might be useful to familiarize yourself with some of the do’s and don’ts of talking about climate change. These tips from Climate Nexus can be used whether you’re talking to legislators, your colleagues, or the public. You can also listen to this webinar put on by the American Public Health Association on the topic of communicating about climate change. Once you’re ready to contact a state legislator, you can use this portal to access your state legislature’s website and find contact info. On state legislative websites, you can usually search for legislators by district, alphabetically, by party, and/or by committee. There is also usually a function on the website that allows you to identify your legislator by typing in your address. You can then either write or call to share your views with the legislator. You may even want to set up a meeting with the legislator or their staff. The resources below provide tips on doing so. Working together with others to do a joint letter can amplify the weight of the letter. Sign-on letters can include individuals, organizations, or both. You can also call your legislator. State legislators generally have schedulers who can schedule you over the phone or via email for a meeting with the legislator or legislative staff in the legislator’s State Capitol office or the legislator’s local district office. You can use the sample meeting request letter at the end of this resource as a rough template for requesting a meeting. 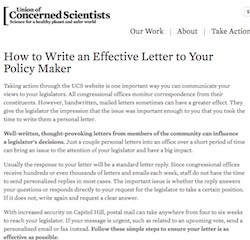 This resource from Union of Concerned Scientists provides tips on How to Have an Effective Visit With Your Policy Maker. 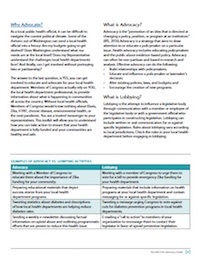 You can also review this resource from LWVOR on effective lobbying tips. Testifying on a bill is another important way to communicate with legislators. You can be formally invited to testify in front of a committee or you can testify as part of open public comment at a committee hearing. When you testify (especially when you are invited), you can provide written testimony for the record, and offer a shorter summary of the testimony orally. 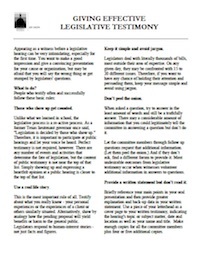 General tips on testifying (one higher level from the American Academy of Family Physicians and one more nuts and bolts at a state-level from the Oregon Legislature), specific tips on invited testimony from the American College of Emergency Physicians, a rough template for testimony from the League of Women Voters of Oregon, and an example of oral testimony delivered by a health professional on climate change legislation are provided below. There are a multitude of other ways to communicate with your legislator. Some of the other ways include through social media or at public events. Legislators and staff pay attention to local news, so op-eds and letters to the editors can also be good ways to get your message to legislators. See resources on those in the op-ed section below. Understanding the process outlined in the Policy 101 section and the ways to communicate with legislators in this section, will make you a stronger advocate. Two resources from California’s legislature help connect the dots by showing where and how all of these pieces relate. Op-eds and letters to the editor (generally shorter) are another great way to advocate. They can be about specific bills the legislature is considering or on the general importance of acting on climate change. Some tips on writing op-eds and letters to the editor are included below, along with some actual examples. One of the best ways to learn more about climate policy in your state and stay up-to-date on the latest legislative developments is to connect with an organization who is working in your state on climate policy. That may be one of the US Climate and Health Alliance members, a group of health professionals in your state who are connected to a professional association, or a local environmental group. To do your own research on climate legislation, we’ve recommended several databases of climate legislation searchable by state. The National Conference of State Legislature’s Energy and Environmental Legislation Database covers state climate, renewable energy, energy efficiency, and transportation legislation. Updated weekly. The Digital Environmental Legislative Handbook compiles information on current legislation divided into 4 (interconnected) categories: air quality, energy efficiency & renewable energy, human health, and climate change. Its goal is to assist legislators, but provides good information and best practices as well as actual legislation in a number of states that can also be very helpful for health professionals. The Nature Conservancy’s State Policy Opportunity Tracker for Clean Energy provides snapshots of what renewable energy and energy efficiency policies are already in place in each state, ranks the strengths of those policies, identifies policy gaps, and provides key contacts and data regarding energy production in each state. The NC Clean Energy Technology Center’s Database of State Incentives for Renewables & Efficiency (DSIRE) is a database of existing state renewable energy and energy efficiency policies. Searchable by policy or financial incentive type (e.g. grants, loans, rebates, etc.). The American Council for an Energy-Efficiency Economy’s State and Local Policy Database provides a summary and ranking of energy efficiency policies in each state. The National Conference of State Legislature’s Transportation Funding and Finance Legislation Database tracks enacted, pending and failed bills related to state-level transportation funding and finance options. The Transportation For America’s State Policy and Funding Legislation Tracker tracks selected state transportation bills that are raising new funding for transportation, improving the underlying policies, or taking disappointing steps backwards.